IBTM arabia, part of ibtm events’ global portfolio of meetings and events industry trade shows, has announced the first details of its twelfth edition, taking place at Jumeirah Etihad Towers in Abu Dhabi, from February 5 to 7, 2018.
ibtm arabia is an exclusive one-to-one format event, which will this year see the introduction of ibtm events’ enhanced Hosted Buyer programme. hosted buyers have been pre-selected and qualified, allowing them to be fast-tracked through the process. This means that the team can be even more targeted in ensuring the highest calibre hosted buyers are invited to attend the event. The programme also has been designed to deliver added value for exhibitors, by targeting buyers matched according to exhibitor needs. Following conversations with and feedback from hosted buyers and exhibitors about maximising the value of attending the event, for the first time this year, domestic hosted buyers will be able to attend solely on the third day of the event, rather than for the entire duration, in order to ensure that meeting time is used as efficiently as possible. ibtm arabia is the most established event of its kind in the Middle East Mice industry, and provides hosted buyers with a personalised timetable of one-to-one meetings with a hand-picked selection of Exhibitors. With over 2,100 pre-planned meetings taking place during the three-day event in 2017, the event was hailed a great success. Meetings for the 250+ industry professionals are scheduled by mutually-matching exhibitors and hosted buyers using ibtm events’ bespoke ‘matchmaking’ software, ensuring the best possible return on investment. As a result, attendees can leave the event knowing they’ve met with the most relevant industry professionals for their business’ needs. Shinu Pillai, exhibition manager, ibtm arabia, comments: “We’re really excited to launch this year’s event. We’ve worked hard since the last edition to understand how we can further enhance the programme to ensure it’s as productive as possible for our attendees. We’ve added several new opportunities for exhibitors, including the chance for them to hold destination presentations in our central hub area, as well as panel sessions where they can discuss and debate some of the industry’s most pressing issues. The format of the event has been designed to embrace the importance of networking and relationship building ahead of doing business, with more than 10 networking events held over the three-day-long show. 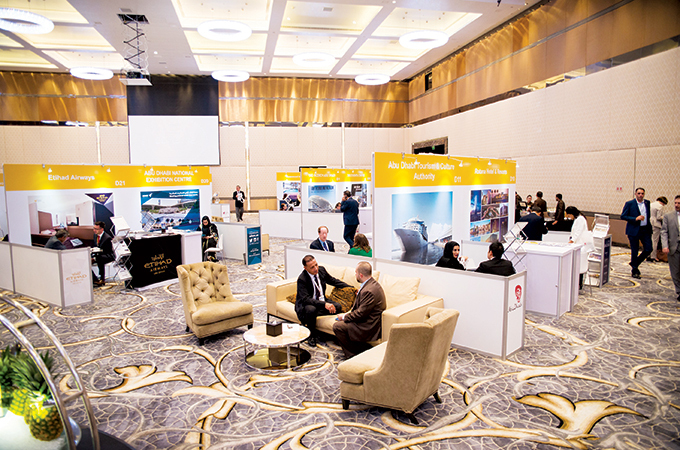 Discovery Day, which takes place on the first day of the event, gives hosted buyers the chance to network in a more relaxed environment, whilst also seeing the sites and experiencing the local culture of Abu Dhabi. Hosted buyers can register their interest to attend ibtm arabia, following an updated process which requires them to produce three supplier references; one of business placed in the previous 12 months and two being proof of future business. They will be accommodated in a five-star luxury seafront resort for three days whilst they meet with their matched suppliers.